I remember the first time I heard of sabacc. I was reading the Jedi Academy Trilogy, Book 2, Dark Apprentice, which was my favorite book for a long time. Han and Lando repeatedly challenge one another to “one last” high-stakes game for the Falcon, each losing and winning until the Falcon goes to Han to stay. From that moment on, I realized that sabacc was a staple in the Star Wars universe, and I’ve been pretty curious about it. As it turns out, the first appearance of the game was in the novelization of The Empire Strikes Back (1980). Probably this came from the line in the second draft of the ESB script where “Han says his friend Lando Calrissian won the gas mine in a ‘sabacca game,’ or ‘so he claims'” (The Annotated Screenplays, p. 191). 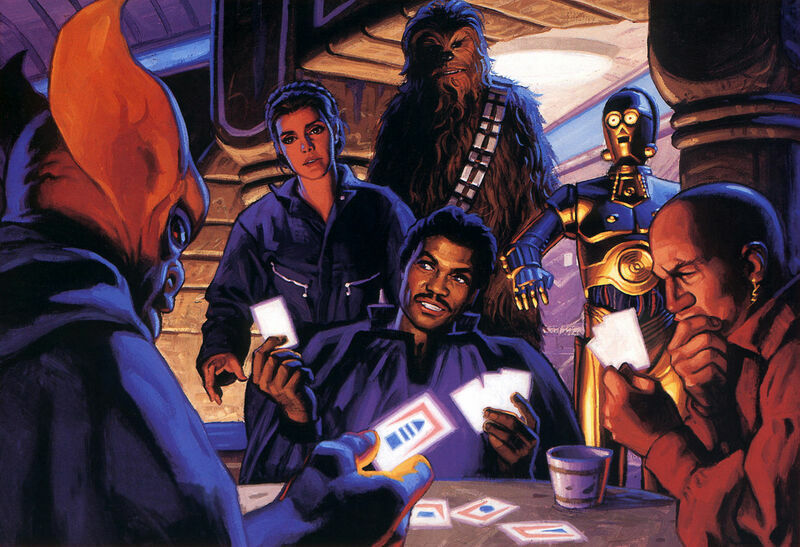 Neil Smith was the first one to name the cards in Lando Calrissian and the Mindharp of Sharu (1983)–a book of questionable canonicty but significant at least for this reason. The game appears in countless books, articles, comics, graphic novels, and other sources, canonical and not. It is basically the galactic equivalent of our poker, though its rules seem to resemble something like baccarat meets blackjack played with a tarot deck. (Sabacc cards could also be used for fortune-telling.) There are many sets of rules, including one that randomizes the rules for you; frequently dealer droids are used to keep track of what the rules are as well as to deal the cards. Cards are electronic, and one element of sabacc includes the random changing of the cards at intervals. If you’d like to try your hand at some online sabacc, Aaron Mavrinac has an incredible casino version you can play (here). I wish you luck ;) And May the Force Be With You! This entry was posted on 3 June 2011 at 11:16 AM and is filed under Fun with tags cards, casino, expanded universe, Sabacc. You can follow any responses to this entry through the RSS 2.0 feed. You can leave a response, or trackback from your own site.